Wednesday was a really tough work day this week, but I suffered through it so I could share these really great ideas with you! In the name of creative exploration, Gigi and I decided to go to Epcot in search of new ideas and a little bit of fun! We took along our friend Loring who made it magical! 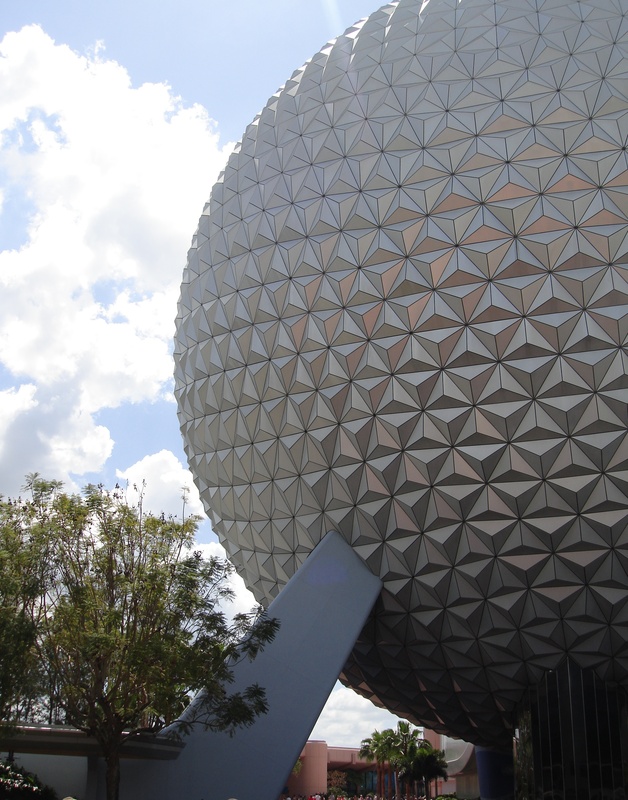 According to Loring, Disney is all about the Ball. 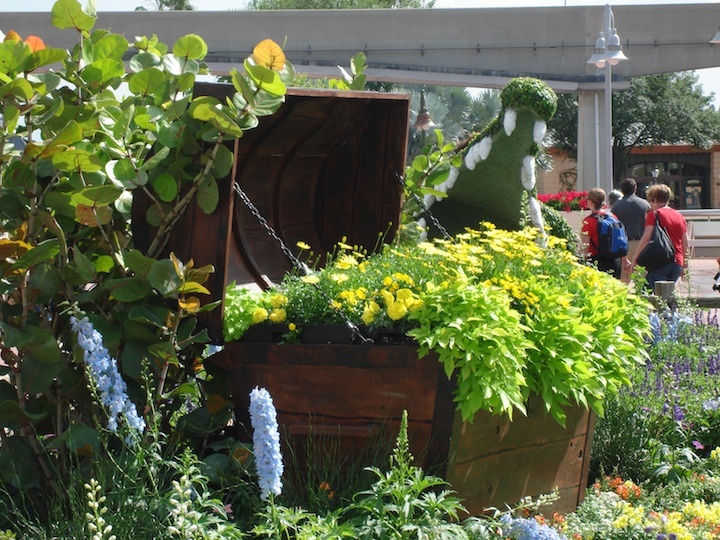 I really hadn’t explored Epcot before, but quickly discovered it is an amazing mix of flowers, plants, science, rides, people and food. Truly an amazing place! Well, okay…it’s all about the Ball AND the fashion. Loring of course, as anyone would know, is Rapunzel… note the fabulous hair she personally designed with a pair of scissors, colored hair bands and scissors. She sleeps in the hair. Every night. She also decided to add my terry cloth Tassi-like headband which she stole borrowed. 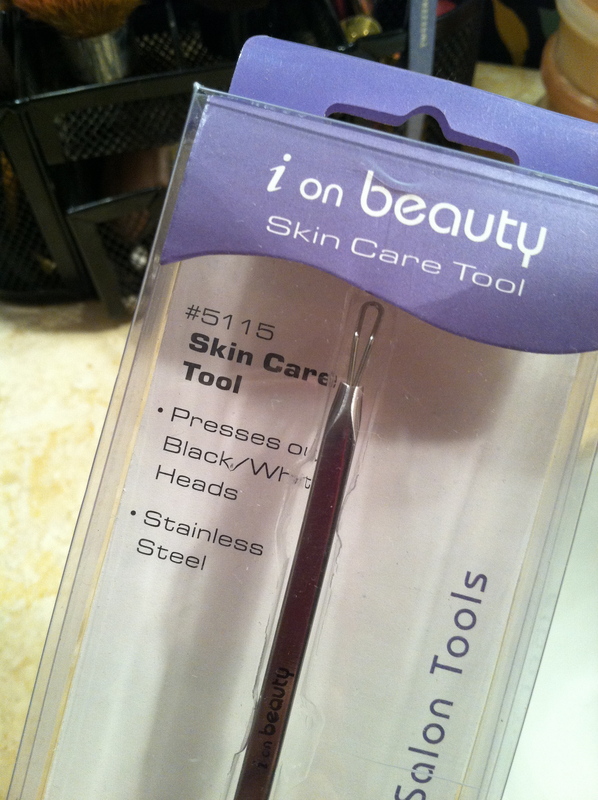 I use it to hold my hair back when I wash my face or put on make-up. 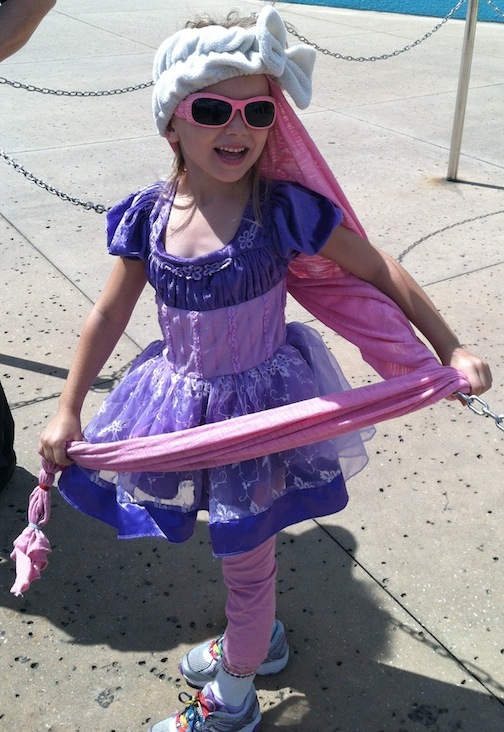 I had no idea how important it was for a princess to have the right “look” at Disney… you should have seen those precious little girls checking each other out! Meanwhile, this is what we were checking out…. 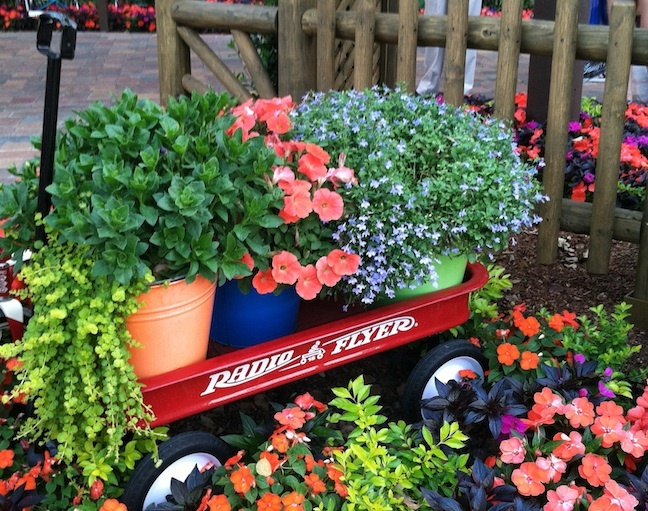 I really like this wagon filled with pots of flowers. 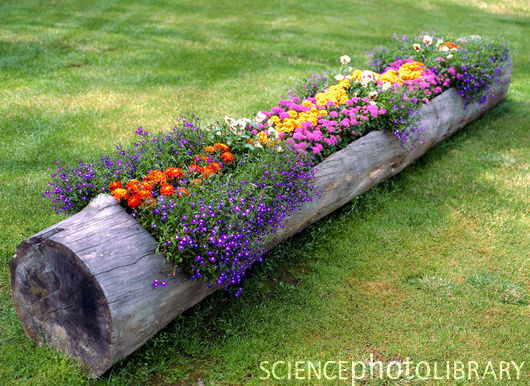 You also could fill it with dirt and plants directly! 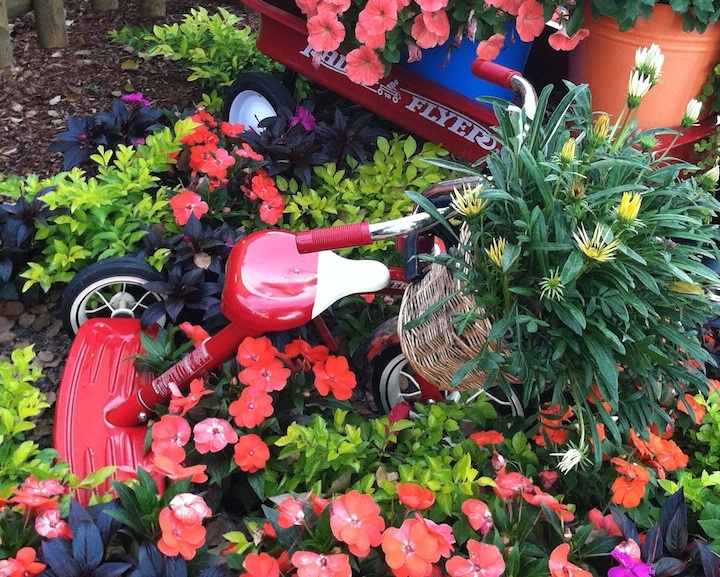 And check this out….when your kids graduate to a larger bicycle, preserve the memories by adding a basket and filling with plants! Adorable, yes? Have a broken old metal chair frame? 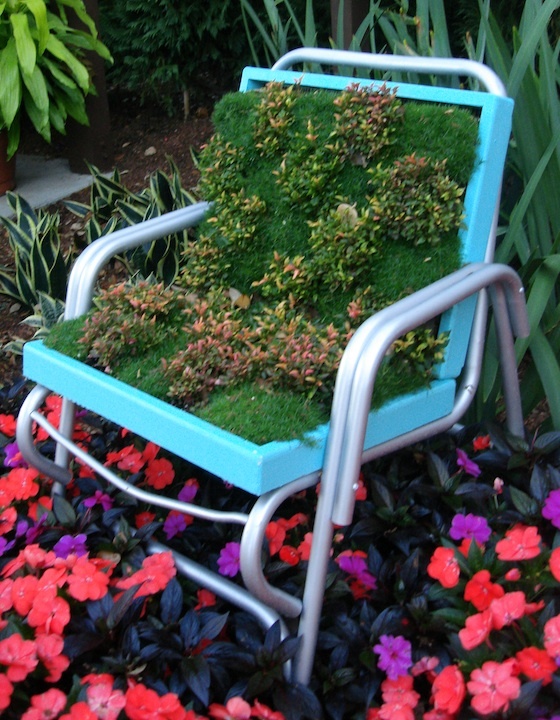 How cute is this for re-purposing? 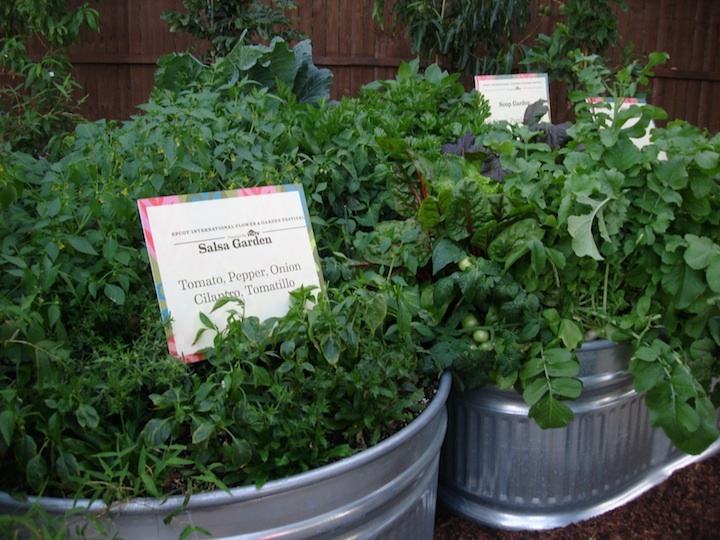 I don’t have a lot of space in my yard for a traditional garden, but these metal tubs would be perfect for my first ever herb garden this summer, don’t you think? And speaking tubs… Do you spy what I spy? 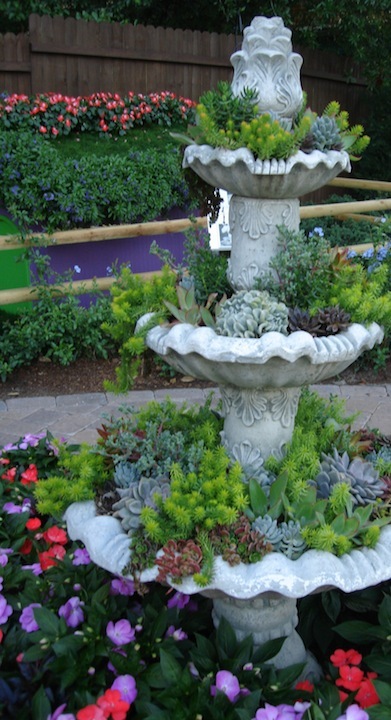 If you have fountain that doesn’t work anymore, no worries! 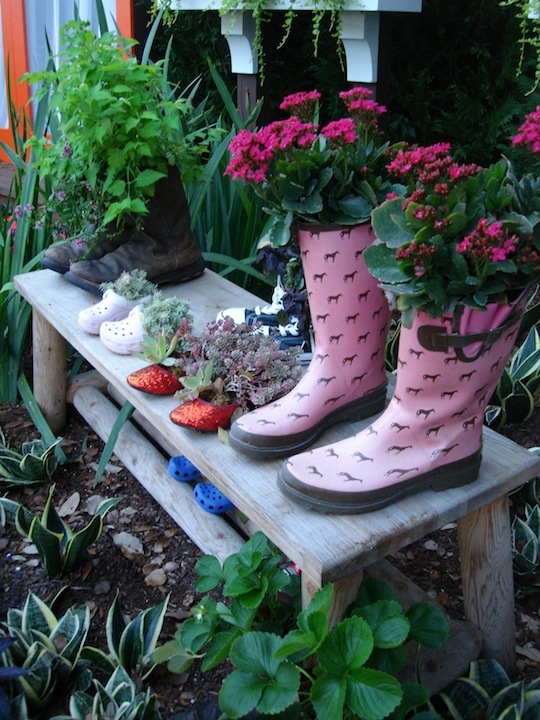 How about this fab idea? 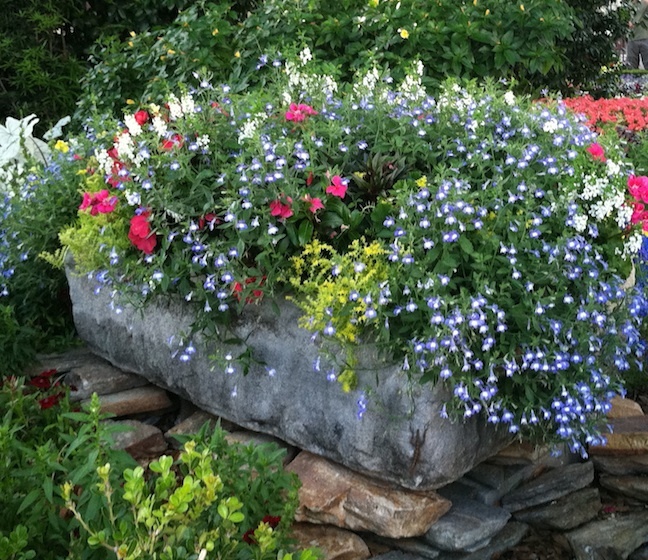 Last, but not least, I found this amazing idea over at Pinterst… I’m going to try this in my yard too, I just adore it! 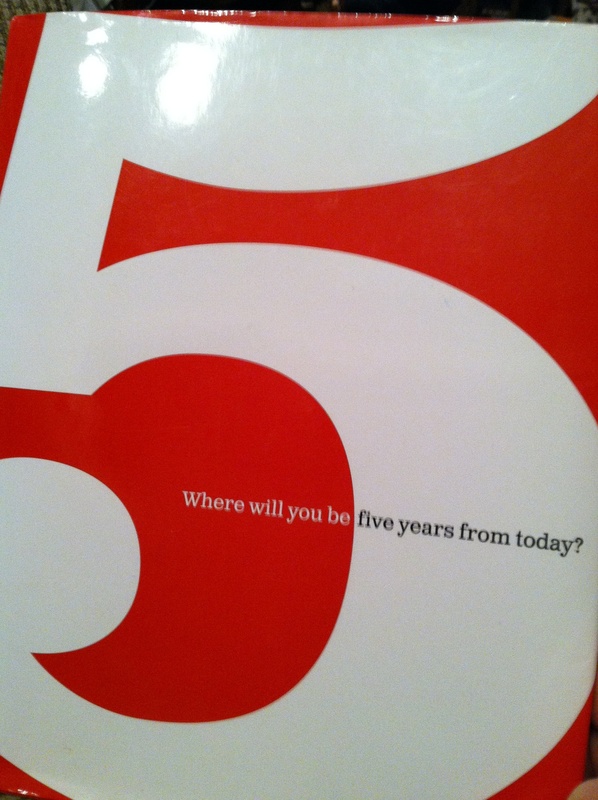 Cord Clips, a Zit Zapper and Where Will You be Five Years from Now? I love things that work, don’t you? 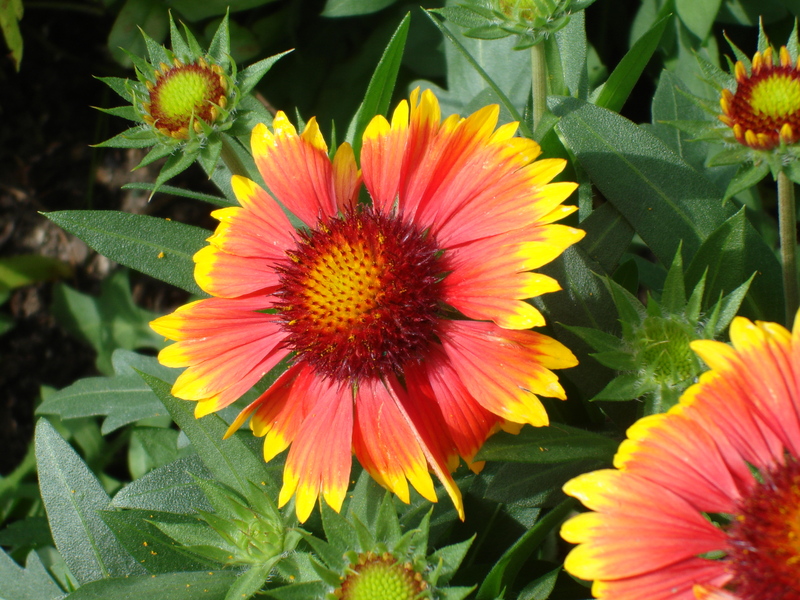 Here are a few things we’ve found lately that we really like! 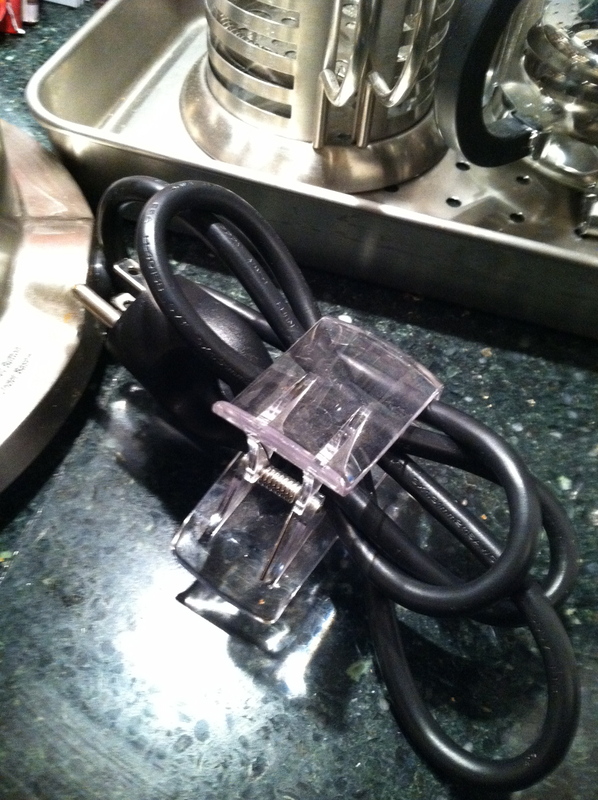 Appliance Cords on my counter drive me crazy and Gigi has been buying clips designed for appliances from our favorite organizational store, BUT at $6.00 a clip, we think it’s a bit pricey. We found these hair clips from Goody sold in packs of three for under $3.00 and we think they work pretty darn well, don’t you? They’re not as well made, but heck, for less than a $1.00 each even if they didn’t hold up as well it would be no big deal to replace if they broke! 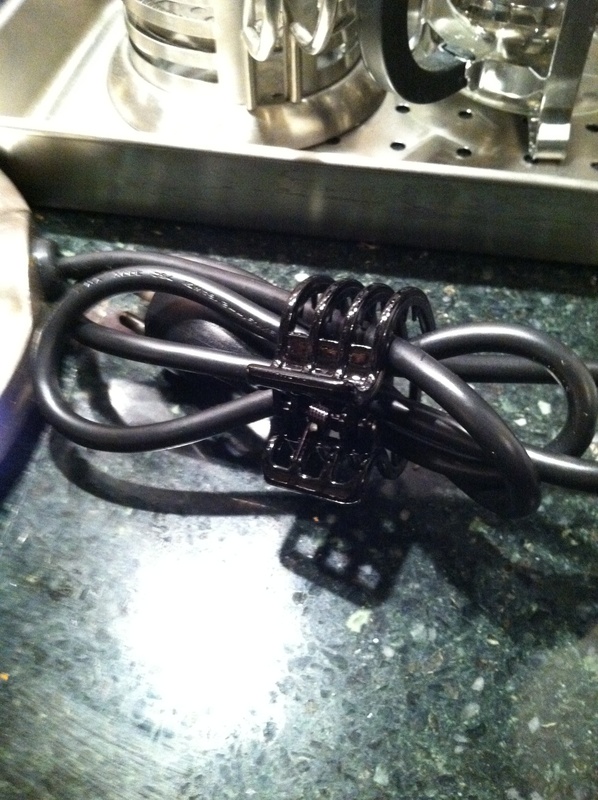 Gigi uses them for her blender, juicer, hair dryer cord, etc. I’m going to have to get some for my house! We found this at Home Goods… I love that store, but Wal-Mart has them as well! 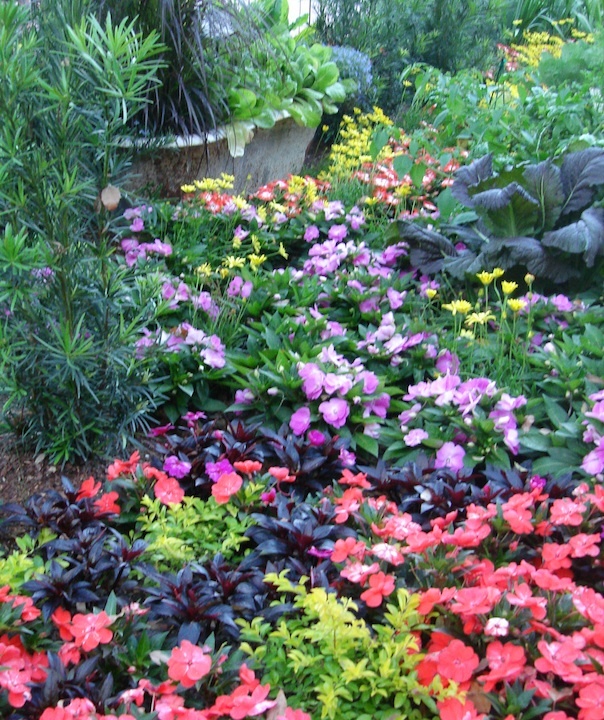 It keeps you from picking too much and is germ free! PS. We also discovered that they still make tinted Clearasil… anyone remember that? It was my BFF in High School! A Confession, Banana Smoothies and Baby Owls! 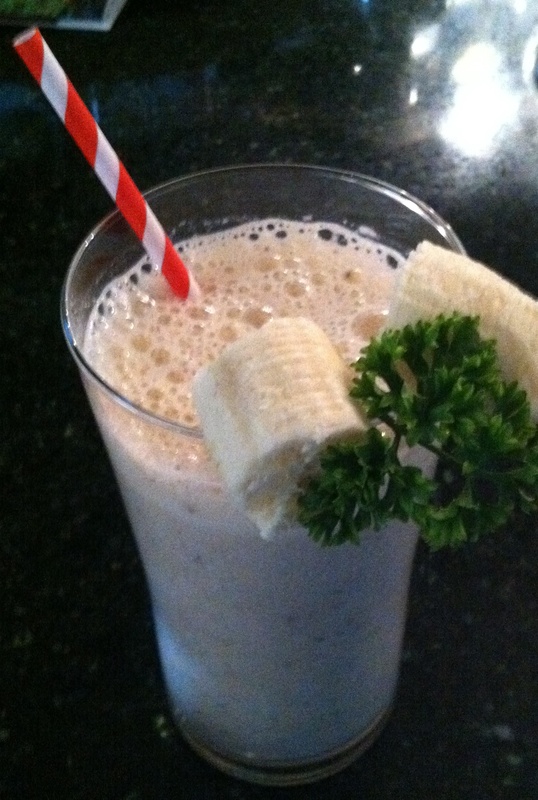 This is not just not your ordinary banana smoothie… it’s loaded with really good things and I choose to have this now whenever those pesky little cravings rear their ugly little heads. You really need to try one. Trust me, you will thank me! Here’s the scoop! NOTE: Ignore the cumin in the photo... that little bugger just snuck in there... Nervy little thing! Ha! 2-3 tsp of vanilla – make sure it’s not imitation! Flax Milk – vanilla or plain. I will tell you that I just don’t love milk. In fact, unless it was with a handful of Oreo cookies, I have never poured myself a glass of milk. Flax milk on the other hand is a different matter. I adore it. Flax milk is good for you – it has lot’s of Omega goodies, tastes great and is only 60 calories per cup. Sixty calories… I really can’t believe that, but there it is on the side of the carton – 60 calories. It’s low in sugar (7 grams) and lactose, dairy, gluten and soy free. Some Wal-Marts are starting to carry it along with whole foods. Yum. Banana’s – Mostly because they are good, less than and a comfort food – click here for 14 reasons why banana’s are good for you! Vanilla – Tastes delicious and has some healthful benefits as well! 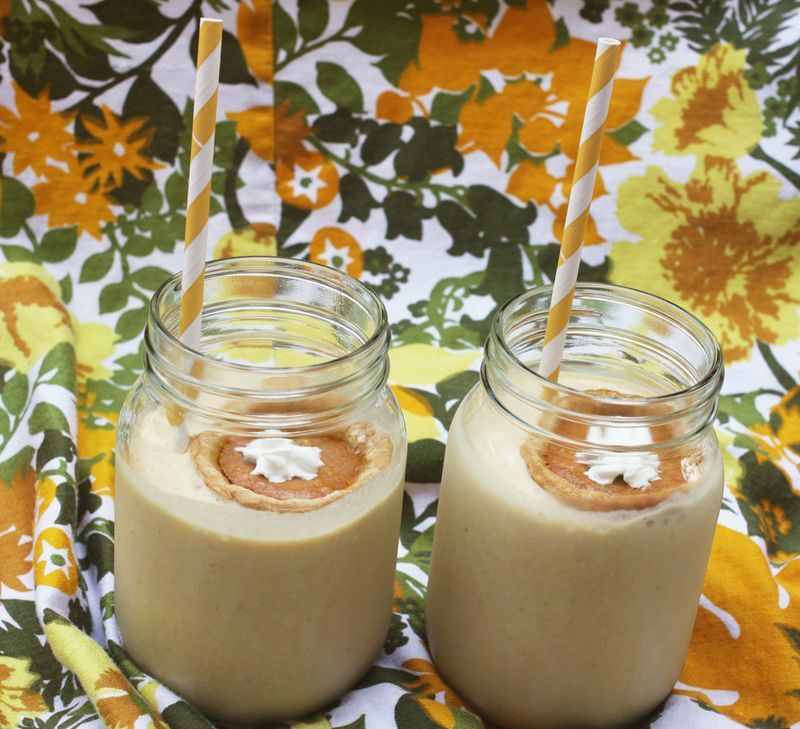 For my smoothies I use pure vanilla extract – have you ever used a real bean? Here’s a great article on the vanilla bean! Cinnamon – Again, tastes delicious and is good for a range of things including high Cholesterol and Type 2 Diabetes as well! You can click to this link for more about cinnamon! Coconut Oil – I actually started adding this because I read it’s beneficial in the quest to slow down or even stop the onset of Alzheimer’s. It runs and my family and I thought to myself…why not? You really can’t taste it and an added bonus I find is it ensures that I am “regular” on a daily basis! I know… TMI. Sorry! Here’s a link to an article I read about coconut oil and Alzheimer’s. FYI… Coconut oil comes in a jar in a semi-solid state unless it’s warmer in your house or at the store and then becomes liquid. If it’s solid I melt on medium heat for less than minute to liquefy. Click here and here learn more about coconuts from my friend Lisa at PickMeYard! Flax Seed and Chia Seeds – Dr Oz has been raving about them lately and when I looked into them further I decided to add them too! Here’s an article I read from Livestrong! They add a bit of a texture to the smoothie and it’s not bad at all! You can also sprinkle on salads, in soups and more! So see… this smoothie tastes good AND is good for you! I love that! 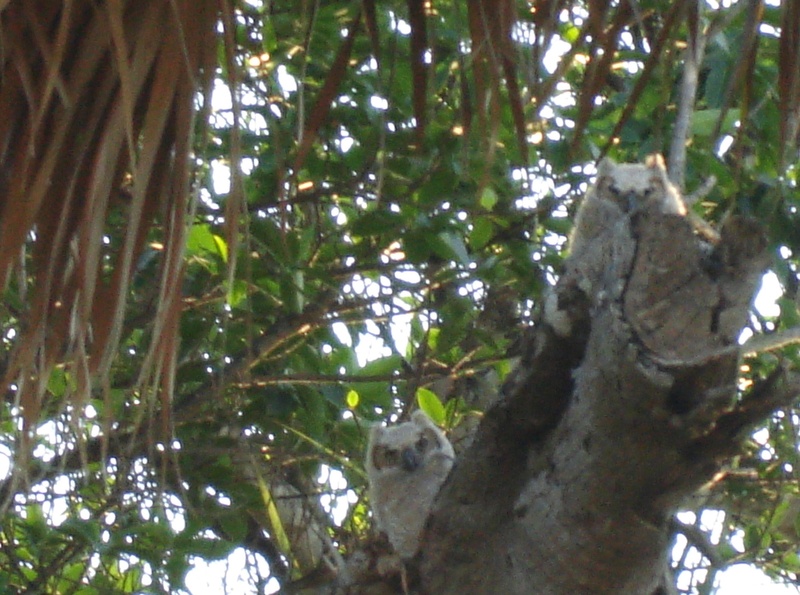 LOOK WHOOOOO’S PEEKING DOWN AT ME! I’m in Florida for a bit working with Gigi – my friend and business partner. She’s my inspiration for getting healthy, cooking clean and more. I’ll introduce her to you soon, I promise – she’s going to start blogging with me and I’m pretty sure between the two of us, you will be entertained, haha! 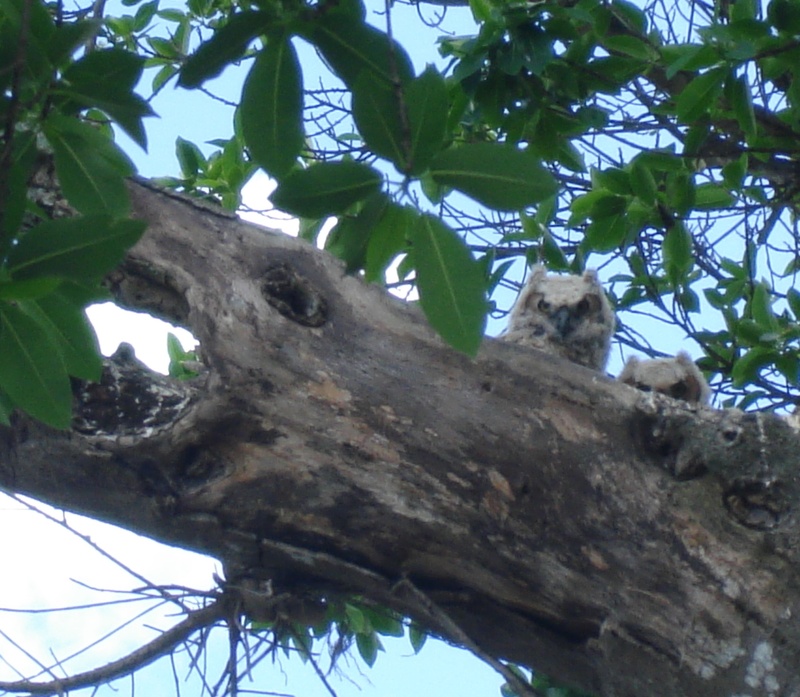 For the longest time Mom and Dad took turns sitting on the nest… Finally, the owlettes hatched and OMG… they are so adorable! The one peeping out above is a bit bolder. There is a second one in there, but he’s a little shy! That’s dad in the photo above – he’s a bit smaller than mom. Once the babies hatched, momma and papa began to hunt together and sometimes watch from afar. 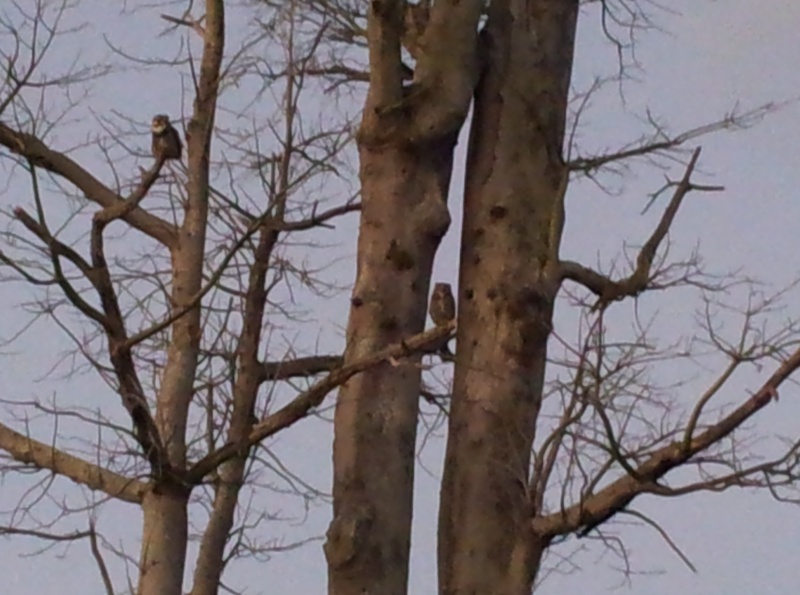 See them above perched high on a nearby tree keeping watch? 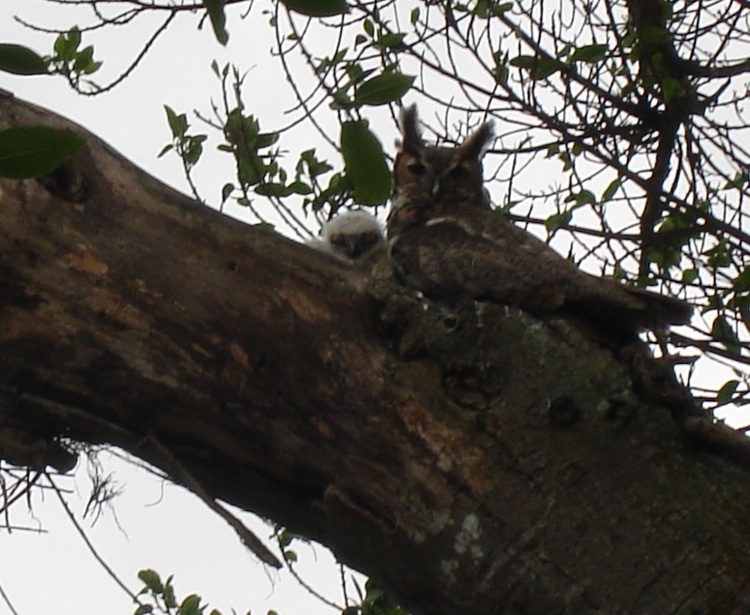 I walked out today and saw both of them sitting in their nest! As you can see, the second one is getting a bit bolder! And then tonight, we saw them being fed! They stopped eating when they saw me, but isn’t this a great shot? 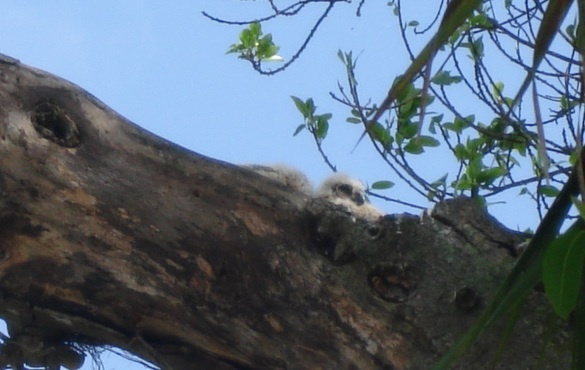 You can’t see it here, but mom is laying inside the nest watching them. So adorable! 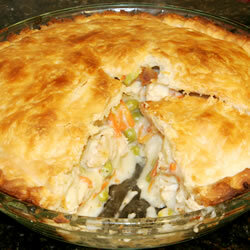 It’s Pi Day… Let’s Celebrate with a Pie or Two! It seems whenever Christmas or Thanksgiving comes a long, I get requests for a good ole fashioned apple pie, so when I found this recipe from Grandma Ople online I had to try it! Boy was I glad I did! Nothing fancy, just apple pie like it should be! Speaking of Pies, I have to share my favorite tool for pies. 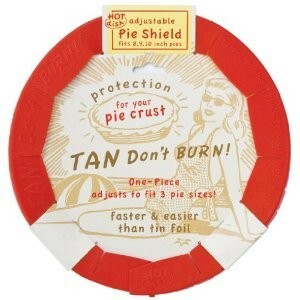 I hate it when the crust gets burned and for years I put foil on the rim to protect it. That was such a waste of foil though – plus it is a pain the tush! I’ve tried the popular metal shields, but they still weren’t perfect and then I found a silicone adjustable rim! One is still a tad short for a few of my oversized pie dishes, but you can double them up if needed! I really, really like these! There are sooooo many sweet little pie treats I’d love to try! I don’t know about you, but pumpkin is one of my favorites… but how about a pumpkin milkshake with a mini-pie floating on top? Probably not really considered a pie, but seriously? Yum. Check the recipe out from A Beautiful Mess. I have been wanting to try these forever! I actually bought a dozen little Ball Jars from Wal-Mart a ways back, but baking all these sweets does not mix well with my New Healthy Diet, so I have been waiting until for a special occasion to try them out! You can find all the details from Our Best Bites. 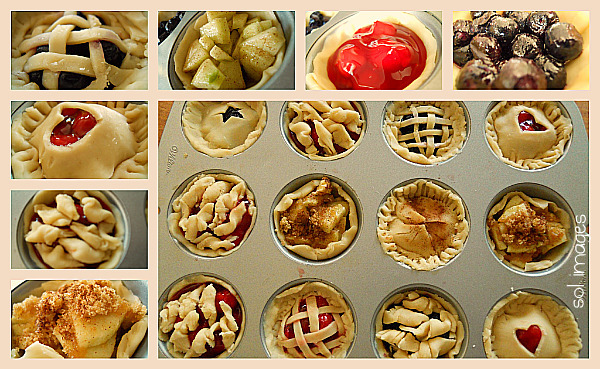 If you don’t have the jars, here’s another way to get adorable little mini-pies! 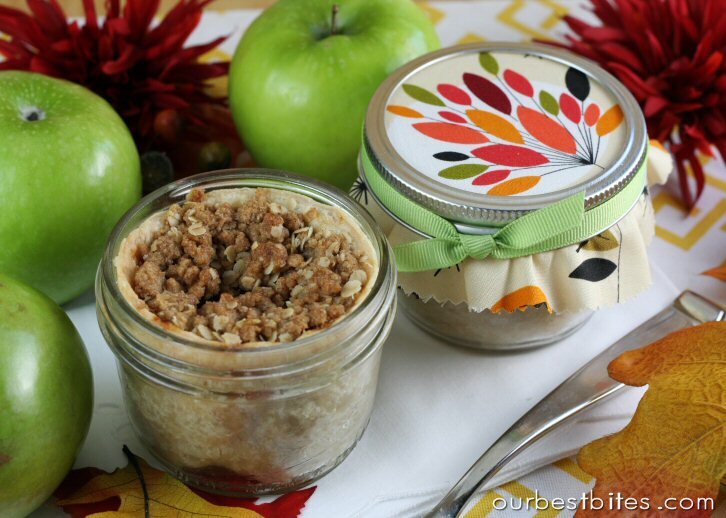 These little cutie patooties are from Simple Organized Living and bake in 20 minutes! 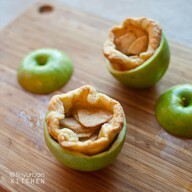 Simply carve out the apple inside to use for the mini-pie filling, bake the pies in a muffin pan and then plop back in the hollowed apple to serve. Adorable, don’t you think? I don’t know about you, but I love a good meatloaf. The problem was my kids “hated” meatloaf. 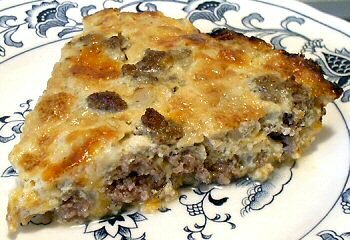 One day, many moons ago, I had a genius idea… I thought to myself…why not make your fabulous meatloaf into a “cheeseburger” pie and see if the kids like that! Guess what? It’s still one of their favorite meals and its soooooo simple to do. Fairly healthy too! You can use the recipe I found on-line pictured above, adapt your own meatloaf recipe, or try mine below, which is really quite basic! 1/2 of a white onion chopped – I like the onions chunky, but younger kids like them chopped finely – aka, won’t know they are there! Bake for 20-25 minutes until meat is no longer pink. Remove from oven and carefully drain any liquid, generously top with shredded cheddar (or favorite cheese) and place back in oven for 3-5 minutes until cheese is mostly melted. Slice with a pizza cutter and serve! Enjoy!